Brainstorm is John’s first DVD. 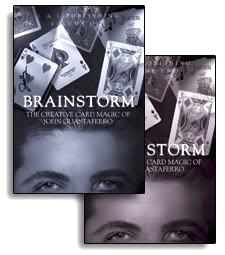 Released in 2003, it is still hailed by magicians worldwide for it’s commercial card routines.Brainstorm features some of John’s finest card creations, highlighting a unique blend of creative presentations, diabolical methods and maximum entertainment value. Most of these effects can be done strolling, without the need for tables or lengthy set up, and are within the reach of the average magician. See for yourself how well this magic plays and discover the carefully-constructed methods and routining behind the effects, all designed to captivate and floor audiences. Learn the real work behind John’s versatile in-the-hands false cut that’s simply beautiful to watch. Once you learn it, you’ll never want to do without it. In this charming packet trick, four frog-imprinted cards hop over one at a time, then change into princes after the spectator blows a kiss. Just wait for the final surprise! Quick, someone call “deck” support! Your cards have crashed, leaving nothing but backs on both sides. Here’s a fun, all-backs routine with a surprising twist. Demonstrate your expert card handling in this simple, yet powerful Ace-cutting demonstration, which leads into a strong transposition. The four Aces make a startling revelation, then change while in the spectator’s hand. This is a quick and clever sandwich routine where two selected cards magically change places! Tune in and see for yourself how well it plays. A three-card monte exhibition ends with an absolutely impossible-looking transposition. This is a perfect follow-up to Club Sandwich. Jokers keep popping up, getting in the way of your award-winning card trick. Prove that jokers really are wild in this impromptu, magic-packed routine. Take your audience on a whimsical road trip as a card “drives” here and there, finally parking in your wallet. This is a fun, logical card to wallet routine you will use. After expertly cutting to the four Aces in a topsy-turvy shuffled deck, you visibly make the entire deck change color! Your spectator is the guest of honor at an exclusive party the cards are throwing. Show your audience to a fun time in this thoroughly entertaining in-the-hands Triumph routine. Completely floor your audience with this elegant (and quite eerie) revelation of a thought-of card. Just like real mind reading. In this small-packet Hofsinzer-inspired miracle, the four Queens use their women’s intuition to reveal a spectator’s card. Absolutely stunning! The four Aces and four Queens not only change places, but change back designs as well. “It is one of the strongest small packet transpositions I have ever seen,” says Gordon Bean. In this mesmerizing routine, the ink simply melts away from both sides of the deck, then magically returns. It’s so visual and deceptive, you’ll swear it uses rough and smooth cards. (It doesn’t). Using a four-of-a-kind of the spectator’s choosing, you cause each of the cards to turn face-down, then transform…twice! The cards work as a team in this flashy four-card revelation, where each card helps find the next. Just discovered…the two-phase prequel to Paul Harris’ Bizarre Twist, featuring a clean and clever approach to the Point of Departure plot. A modern twist to the classic Jazz Aces plot. Here, the four Jacks vanish into a black hole, leaving behind a startling surprise. This is a true showstopper, featuring an impossible prediction of four randomly-selected cards…and an astonishing finale that no one could have predicted!